Adds support for sending notifications across a variety of different channels, including mail, SMS and Slack. 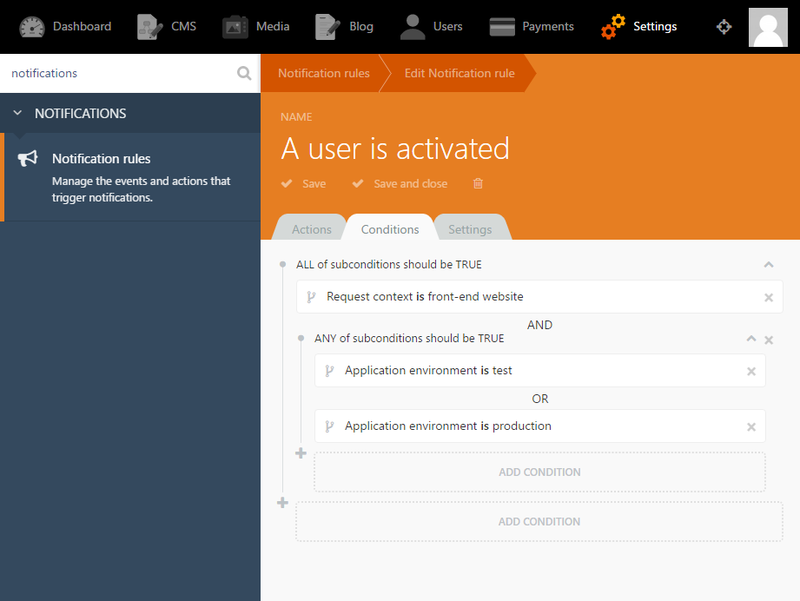 Notifications are managed in the back-end area by navigating to Settings > Notification rules. # 78 in Paid of all time. # 97 in Paid of all time. Here is an example of a plugin registering notification rules. The groups definition will create containers that are used to better organise events. The presets definition specifies notification rules defined by the system. Here is an example of triggering a notification. The system event rainlab.user.activate is bound to the UserActivatedEvent class. Here is an example of registering context parameters, which are available globally to all notifications. An event class is responsible for preparing the parameters passed to the conditions and actions. The static method makeParamsFromEvent will take the arguments provided by the system event and convert them in to parameters. * @var array Local conditions supported by this event. * Returns information about this event, including name and description. * Defines the usable parameters provided by this class. Action classes define the final step in a notification and subsequently perform the notification itself. Some examples might be sending and email or writing to the database. * Field configuration for the action. A form fields definition file is used to provide form fields when the action is established. These values are accessed from condition using the host model via the $this-&gt;host property. An action may choose to provide no form fields by simply returning false from the defineFormFields method. A condition class should specify how it should appear in the user interface, providing a name, title and summary text. It also must declare an isTrue method for evaluating whether the condition is true or not. * Field configuration for the condition. A form fields definition file is used to provide form fields when the condition is established. These values are accessed from condition using the host model via the $this-&gt;host property. Model attribute conditions are designed specially for applying conditions to sets of model attributes. * @param array $params Specifies a list of parameters as an associative array. An attributes definition file is used to specify which attributes should be included in the condition. There is a dedicated table in the database for storing events and their parameters. This table is accessed using the RainLab\UserPlus\Models\Notification model and can be referenced as a relation from your own models. 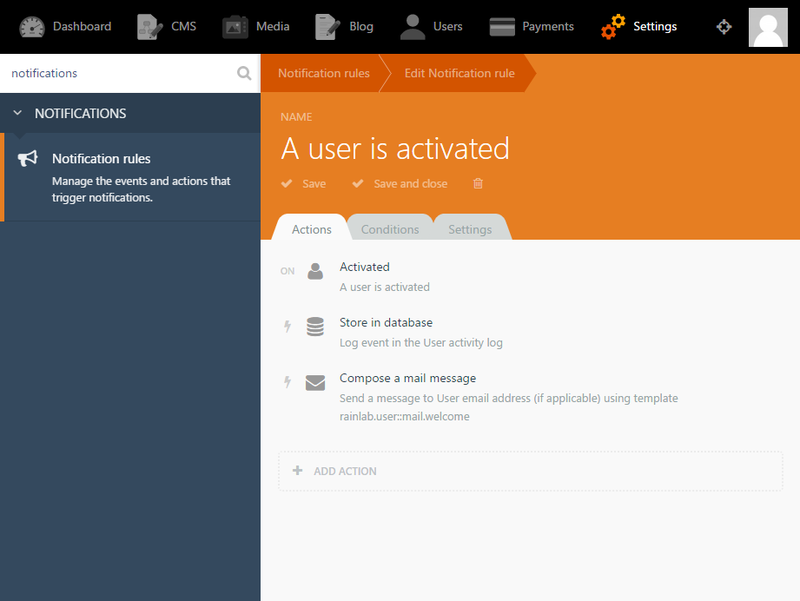 In this example the MyProject model contains its own notification channel called notifications. This channel should be registered with the RainLab\Notify\NotifyRules\SaveDatabaseAction so it appears as a related object when selecting the action. The label is shown as the related object, the class references the model class, the relation refers to the relation name. The param defines the parameter name, passed to the triggering event. Events can be extended to include new local conditions. Simply add the condition class to the event $conditions array property. Can you please make a tutorial for the Notify Plugin...thanks.